An aid worker helps pull a disabled Syrian refugee, who lost his leg to diabetes, through the no man’s land between Macedonia and Serbia. Accessible social and health services, with dedicated human and financial resources must be addressed and made available for persons with disabilities in the new global framework on refugees and migrants, a group of United Nations human rights experts have urged, as UN-led intergovernmental talks on the issue are set to launch consultation in 2018. The framework, entitled Global Compact for Migration will set out a range of principles and commitments among governments to enhance coordination on international migration and is due to be adopted in 2018. The Compact is one of the key outcomes of last year’s UN Summit on Refugees and Migrants. “The new Global Compact is a unique opportunity to address the shortcomings of a migration and refugee system built on policies that lack consideration for persons with disabilities, said Theresia Degener, the Chair of the Committee on the Rights of Persons with Disabilities. Dedicated human and financial resources, she stressed, should be included in the new framework to identify persons with disabilities in reception and detention centres and to provide adequate standards of living and healthcare, including psycho-social support. However, “we are deeply concerned about the precarious situation of persons with disabilities in the current migration crisis,” said Catalina Devandas Aguilar, the Special Rapporteur on the Rights of Persons with Disabilities. She added that many countries lack formal procedures to identify migrants and refugees with disabilities and, consequently, fail to provide them with protection and essential services, such as shelter and medical care that are accessible and responsive to their needs. 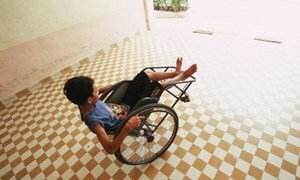 Persons with disabilities face exclusion and discrimination due to a lack of accessibility, including with respect to humanitarian assistance, and denial of reasonable accommodation, according to a joint statement on “Addressing disabilities in large-scale movements of refugees and Migrants”, issued by the Committee on Migrant Workers and the Committee on the Rights of Persons with Disabilities. The joint statement further called on Member States to realize the rights of migrants and refugees with disabilities in accordance with their international human rights treaty obligations. “We need to be sure that, when world leaders commit to saving the lives of refugees and migrants […] they don’t forget about persons with disabilities,” said Jose Brillantes, the Chair of the UN Committee on the Protection of the Rights of All Migrant Workers and members of Their Families. On 6 April, the UN General Assembly adopted a resolution on the modalities for negotiations for the next 12 months in the run-up to the adoption of the Global Compact on Migration.